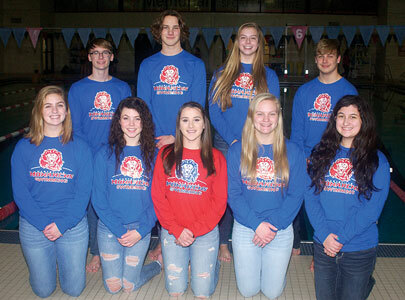 Returning lettermen for the Monarch swimming program are from left, front row, Madelyn Murphy, Mikayla Seman, Rachel Poling, Morgan Grawe and Remini Roush; back row, Ethan Turk, Hank Luther, Diana Jimenez and Aron Moledor. The Marysville Monarch swim teams opened their duals season with a loss to Worthington Kilbourne on Tuesday. The Lady Monarchs lost, 91-76, while boys fell, 112-38. Although the Monarchs dropped their season-opener, head coach Craig Faircloth was pleased with their efforts. “I’m very pleased to see the level of effort and competitiveness they showed during our first meet of the season,” he said. “Our goal each year is to prepare each swimmer and relay team to achieve their best times at the end of the season during the OCC, sectional, district and state championship meet progression. Hank Luther was the Monarchs’ top-performing swimmer. He captured the 100-meter breaststroke in a time of 1:05.91. Rachel Poling was the Lady Monarchs’ top swimmer with a first-place finish in the 100-meter breaststroke in a time of 1:11.46. -Girls 400-yard freestyle relay: Grawe, Jimenez, Seman and Poling, 4:15.22. The Monarch swim teams will return to the pool on Saturday at The Ohio State University’s Neb Reed Invitational.